Jasmine Yin Zhen Silver Needle is fine white tea composed of young leaves and buds with a light whisper of pure, delicate and fragrant jasmine blossoms. Ours is an organically grown Jasmine Yin Zhen Silver Needle, it is a sophisticated, light and delicate tea with subtle complexity all of its own. Jasmine is a night-blooming flower that is incredibly fragrant; prized throughout China, while it is in bloom a gentle breeze can carry its distinct fragrance through the air as you walk throughout your day. Steeping brings out a pale golden infusion that is highly aromatic and sure to delight the senses; the resulting flavor of the infusion is subtly sweet, and highly fragrant. It is a mild, exquisite white tea that makes for a wonderful companion. Jasmine Yin Zhen Silver Needle is naturally low in caffeine and rich in anti-oxidants. Chinese White Tea. Organic. Exceptional Traditional China Tea. Luxury Loose Tea. Antioxidant Rich. Beautifying. Gongfu Cha. Jasmine Yin Zhen Silver Needle is a luxurious fine tea that is delicately scented with fragrant jasmine. All Natural. Jasmine Silver Needle tea is made without flavors or added fillers. 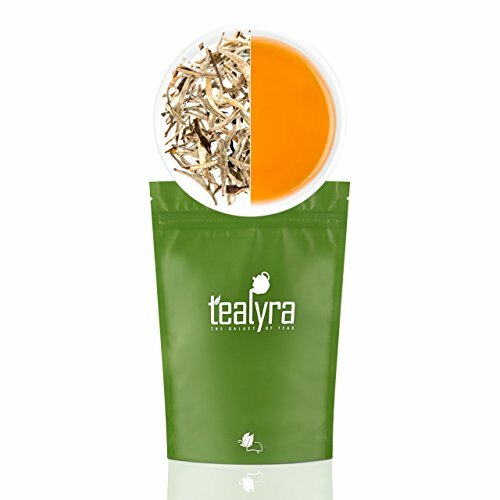 Our Jasmine Silver Needle produces a pale golden infusion that is subtly sweet, and highly fragrant. It is a mild, exquisite white tea that makes for a wonderful companion.